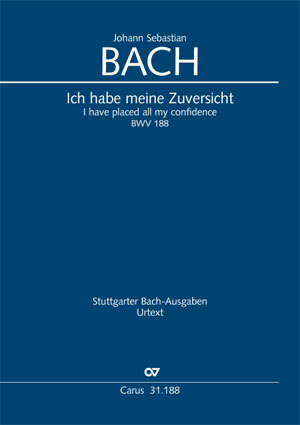 This coming autumn is once again full of new publications to our customary high standard: our Bach vocal project is reaching its finale, so that this month we are once again able to present new treasures from Bach's sacred vocal works, including the cantatas Ich habe meine Zuversicht (I have placed all my confidence) BWV 188 and Ich steh mit einem Fuß im Grabe (I stand with my open grave before me) BWV 156. 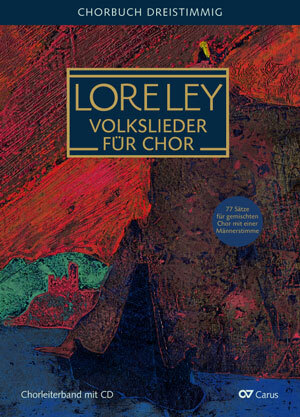 This month also sees the publication of the long-awaited third volume in the LORELEY choral collection series, a wonderful collection of German folk songs in new, up-to-date choral arrangements. The latest volume contains arrangements (for SAM or SSAM) for mixed choirs with just one male voice part. Songs are a reflection of their time, they come and go, but the best endure and become classics and evergreens. The new installment of the LIEDERPROJEKT offers a true treasure of songs. Six cantatas are newly released this month. In this year's anniversary of the Reformation we will be presenting the complete edition of Bach's sacred vocal works with the Bach vocal project. Pre-order the Complete Edition now at the introductory price of 629 Euros instead of 769 Euros (publication in November). 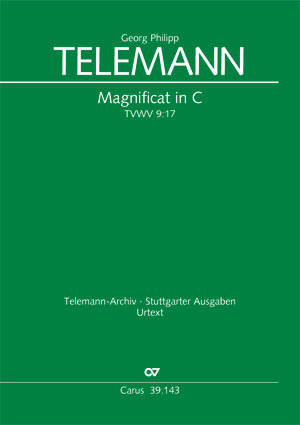 This month we publish the first scholarly-critical edition of Telemann's Magnificat in C. Telemann composed this imposing work, like Bach's Magnificat , sumptuously scored with three trumpets and timpani. For ambitious church choirs the work is really worthwhile, and it is also a most effective piece which audiences will enjoy. The complete performance material is of course also available from us. 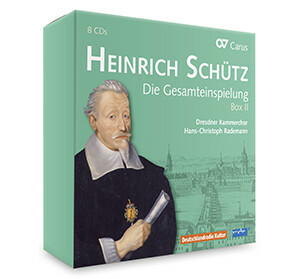 Some new CDs have just been released on our label this month, including the second box set in the Schütz Complete Recording, György Ligeti's Requiem in a recording by Frieder Bernius and the Kammerchor Stuttgart, and the CD Sunrise with works for organ solo and organ with orchestra, composed and interpreted by Kay Johannsen. We are constantly expanding our repertoire in carus music, the choir app. 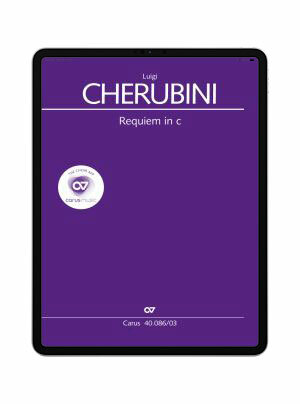 This month too there are two new works: Cherubini's Requiem in C minor and Homilius's Advent cantata Ergreifet die Psalter, ihr christlichen Chöre. With carus music, the new choir app, you can follow the music while listening to a top-class recording on your smartphone or tablet, and easily practice your own choral part with the help of a coach. 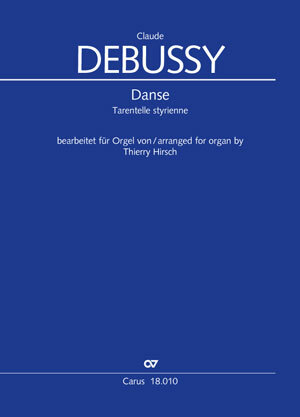 The arrangement of Debussy's Danse – originally written for piano – is being published in time for the Debussy anniversary year in 2018, and has already been performed in several countries to great success. Congratulations! 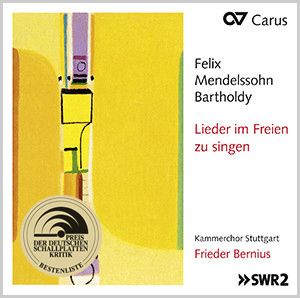 Frieder Bernius and the Kammerchor Stuttgart have convinced the jury of the German Record Critics' Award with their new CD of Felix Mendelssohn Bartholdy's Lieder im Freien zu singen . The recording appears in the current List of the Best 3/2017. Every quarter the List of the Best contains the best and most interesting new releases from the preceding three months. The evaluation criteria are artistic quality, value of repertoire, presentation, and sound quality. Sarah Schweiger has followed the composer Peter Schindler and his works since she began working at Carus-Verlag. So she was able to experience at first hand how he works on his pieces with a choir at the Choratelier in 2016. Her favorite piece by him is Zirkus Furioso (Zirkus Allegro). In this musical we live through an eventful, but (because of that) very amusing afternoon with the circus director Leo Pimpelmoser.